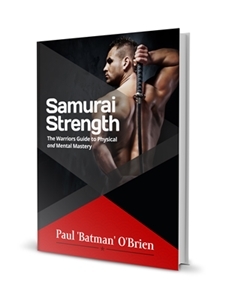 Shinogi and Niku, The Ridgeline and Meat of the Blade Explained is just once chapter in the highly detailed and crictically aclaimed guide to samurai swords - The Sensei's Sword. Be sure to check out the complete guide - here. The shinogi, as defined earlier, is a ridge on the blade that that runs from the yokote to the end of the nakago. Niku, is a little harder to explain – it literally translates as "meat" and refers to the bulging out of the blade's metal from the shinogi to the ha. It is the amount of roundness and curvature on the surface of the hiraji (cutting surface). It helps to have a visual reference for these terms. 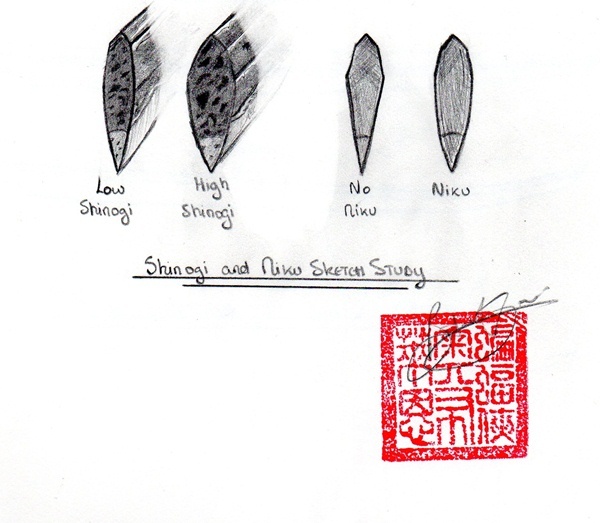 The height and width of shinogi and the amount of niku present are indicative of both the period a blade is made in and the school of its swordsmith. In fact, given the height and width of shinogi, and presence of niku and sugata (blade shape) the experienced Japanese sword aficionado can tell you the period, school and sometimes smith for a given blade. Sword appreciation societies actually have meetings where a blade is displayed in this manner and the participants have to guess the period, school and smith. 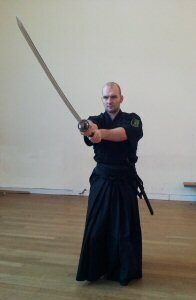 For the purpose of our practice of Musō Jikiden Eishin Ryū and koryū bujutsu, Iaijutsu, Iaido etc. such distinctions between high and low shinogi and the amount of niku are most important, just from a different perspective. A ridge line on the blade, its presence and relative height are important not just for authenticity and accuracy in choosing a blade relevant to your ryū, but also with regards to the practicalities of combat and cutting. It's important to note that there are blades without a shinogi – these are known as blades in the hira-zukuri (平造) style. These blades are nearly flat, without ridge (shinogi) or yokote. These blades are absolutely NOT recommended for the study of Iai. Several techniques within the Musō Jikiden Eishin Ryū, the Musō Shinden Ryū and others have a variety of blocking and parrying techniques that use the shinogiji. As such you need one. A blade with a shinogi is then said to be made in the shinogi-zukuri style. The height of the ridge-line is determined by the relative difference between the shinogi and the kasane (blade thickness). If there is a substantial difference in height between the sane and the shinogi height it is said to be high shinogi. As such blades with thin kasane have a relatively high appearing shinogi. Historically, the Keichō Shintō style blade typically features a high shinogi, which is interesting as they are generally blades of great thickness (kasane). 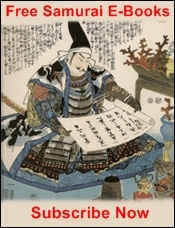 "In Shinto times both Naki Shigekuni and Kunikane also produced high shinogi, since these two smiths followed the Yamato-den...."
Nakamura Sensei, an authority on tameshigiri, notes that except for the width of the blade it is the shinogi height that plays the greatest role in a blade's cutting ability. "Blades with a high ridgeline are good when cutting through harder targets, but against softer ones they fare poorly due to the absorption of energy. A high-ridged blade will lose about half its cutting power when, for example, cutting straw targets in sumeono giri. Comparatively blades with a shallow ridgeline generally have a better cutting ability, although this can vary with the blade's width. They are good at avoiding the energy abortion from softer straw targets and perform laudably when cutting these. However, if the user gets his grip handling wrong, such a blade can easily break". 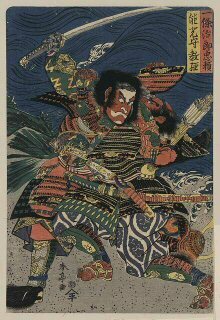 "If the shinogi is high the blade is strong a can cut hard materials. If the shinogi is low, the blade suffers less stress as it passes through a target and it can cut soft materials, but it is weak against hard materials. 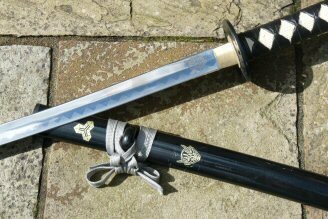 A medium shinogi is best for cutting both hard and soft targets". A high shinogi, however, has additional benefits. The shinogi can appear in the middle of the blade or more towards the mune. If you have the shinogi closer to the mune, this creates a higher shinogi and increases the turbulence of the blade as it moves through the air, adding to the tachikaze created by the bohi, which has already been discussed. In addition, this placement also lightens the blade. Tapering the shinogiji back towards the mune also reduces the surface area of the face of the sword when cutting through a target. This in turn reduces the drag on the blade while cutting. But the shinogi is not the only determining factor. We must also examine the niku. With most traditional blades, and certainly with the Keichō Shintō blades I feel are most appropriate for Musō Jikiden Eishin Ryū, there was substantial niku. In fact, one method of dating blades is to determine how much of the niku has been worn away through repeated polishing. For instance, a blade with a lot of niku, termed a hiraniku ari, likely has not been polished a great deal or incredible care was taken to preserve the blade during polishing. By contrast, a blade that has a lot of niku and that is nearly flat has been polished a lot or by someone without the skill to preserve the blade's geometry. The more niku a blade has, the greater its ability to absorb to shock and impact. This is far better for cutting and cleaving through armour and bone, however the ji (rounding of the blade's surface) means that the ha (blade edge) will never be as sharp as that of a blade that has less niku. Stepping down from the rounded edge and going for a lower profile flatter gradient from the shinogi to the ha means you have a less shock absorption and a greater chance of chipping the blade. It also means the blade can hold a far sharper edge. The sharpest edge, and thus the most likely to chip and break, is the hira-zukuri style blade. This is practically razor – wickedly sharp, but impractical for hard targets and for Iai. This is what "back yard cutters", those who only practice informal stunt cutting, call a "trick cutter". Why Would You Choose Meat over Sharpness? Well, contrary to the popular mythology, the Japanese sword, while a metallurgical masterpiece, is not indestructible. As I recounted in the history section earlier, blades broke and they broke often. Even after the legendary Amakuni, blades still broke; that's the nature of warfare and combat. Blades frequently chipped and bent and in a self-defence scenario you do not want your primary weapon to fail you. As we've seen, the sword developed in response to changes in the nature of warfare. Armour too (see my lecture on the development of armours) changed with the times. We see the development of chain mail, and plate armour made of steel and leather. That's hard to cut through. It's also important to understand that the Japanese sword was hampered in its development to start with. Domestic Japanese steel, tamahagane, isn't very good. This is why Japanese smiths developed the remarkable folding process used in the construction of the nihontō. Beating and folding the steel reduces the amount of impurities in the blade and makes it stronger. The hada (grain pattern) is beautiful to look at, but this is a by-product of the steel's refinement to make it suitable as sword. A balance then must be struck as well, between the brittle metal needed to hold a razor-sharp edge and softer metals needed to absorb shock and impact. With the advent of armour developments, a thicker, nuki-heavy blade is far more important from a tactical perspective. It's still sharp enough to cut, but far better able to handle steel plates, chain mail, leather, flesh and bone. 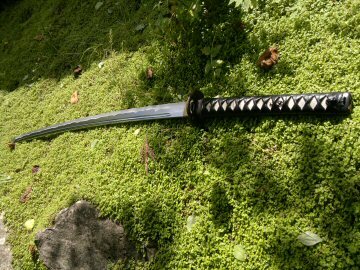 Coming back to historical considerations, it's perhaps not surprising on reflection of the above to note the simpler-to-create hira-zukuri style blade is not common among katana. The most popular design was the shinogi-zukuri style, and the vast majority of these had an ample amount niku. The combination of a shinogi-zukuri blade with good niku produced a stronger blade, more able to deal with impact and with a sufficiently sharp cutting edge that was more resistant to chips, bends and breaks, and had the additional benefit of having a longer shelf life (more niku means more metal to polish). Today, we have access to better steel and modern metal-working methods that can create a Japanese style blade that is practically indestructible. American smith Howard Clark (http://www.mvforge.com), for example, creates a duplex L6 blade with martensite edge but with a bainite body (versus pearlite), and can produce a hira-zukuri style blade with no niku that would have none of the drawbacks that I've noted above. And if all you wanted was a cutting blade, you'd be fine with a hira-zukuri made by a modern master smith such as Mr. Clark. However, if you're reading this you are, like me, probably a student of a koryū bujutsu and as I've mentioned we need a shinogi for a variety of our techniques. And, in favour of keeping to the most accurate blade for the Musō Jikiden Eishin Ryū style and in terms of practical performance, you'll want a blade with decent niku. Sadly, the majority of production swords have very low shinogi and practically no niku. You've been reading about Shinogi and Niku, check out the other incredible chapters and detailed answers in The Sensei's Sword - here.